No wonder they canceled Big Papi night in Boston. 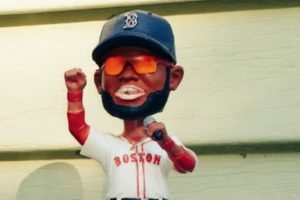 The Boston Red Sox decided to call off their Big Papi Bobblehead night after a failed paint job. I guess the club president took one out of the box and said no way. Good call on their part, but really people…what’s the fascination with these little figurines? Rams head coach Jeff Fisher showed his tough guy side on HBO’s Hard Knocks after a player tried sneaking a woman into his dorm. Fisher has two rules and this guy broke one…now he’s gone. Hint…his last name was Long. If you’re going to sit there and tell me you can’t get excited by the Olympics, I’ll have to unfriend you. How can you not be pumped up? Oh yeah, Mizzou will introduce their new AD tomorrow morning, but you’ll most likely be at work. Don’t worry, I’ve got ya’ covered.